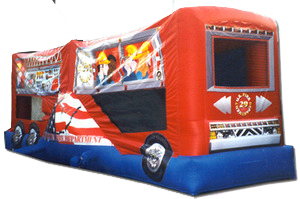 This Firetruck 3 in 1 Large Combo Design Bouncer will spark the interest of your little fireman.This bounce house is literally the size of an actual fire truck! Full size bounce, two person climbing wall, and dual slide. Can Be used wet or dry. Outside artwork resembles a cartoon fire truck,complete with all the bells and whistles of real fire truck. It features an inflatable safety ramp at the entrance to protect excited kids as they scramble to get inside the bouncer. It also has large netted vent windows that keep things cool for the kids and allows parents to keep a watchful eye on all activities inside. Appox 6-8 users at a time.